There is an unprecedented surge in number of returns being e-filed during this year. 92.03 lakh returns have been e-filed up to 30th July, 2013 which is 46.8 % higher than the returns e-filed during the corresponding period of the last fiscal year. Due to large number of taxpayers accessing e-filing website on due date of filing, some cases of taxpayers not being able to access the e-filing portal have been reported. These problems are primarily due to network constrains of the local internet service providers (ISPs). However, as a measure of taxpayers convenience, it has been decided to extend the due date of filing of returns from 31st July, 2013 to 5th August, 2013. Taxpayers are requested to avail of this extension of time and file their returns after paying due taxes. 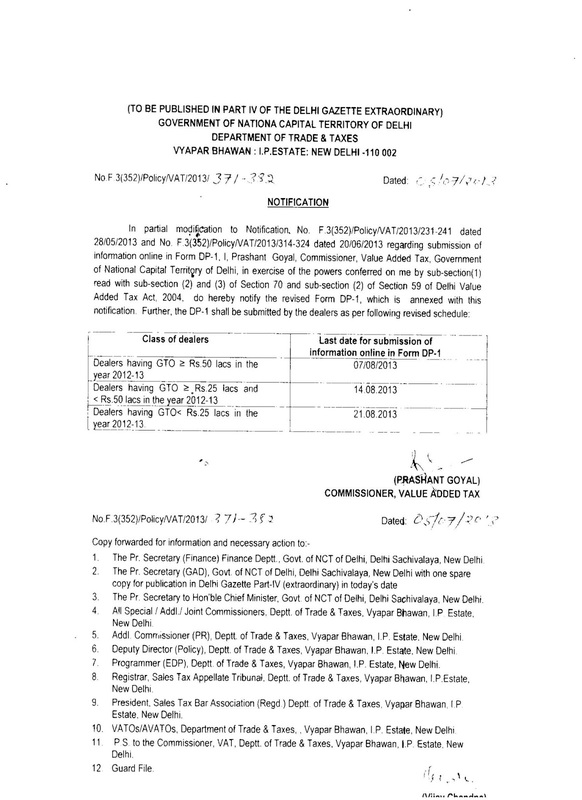 The Value Added Tax Department has vide Circular dated 25.07.2013 extended the last date for filing online Return for the first quarter 2013-14. Annexure 2C and 2D which form part of the return. However it may be noted that the due date for depositing tax is not changed. 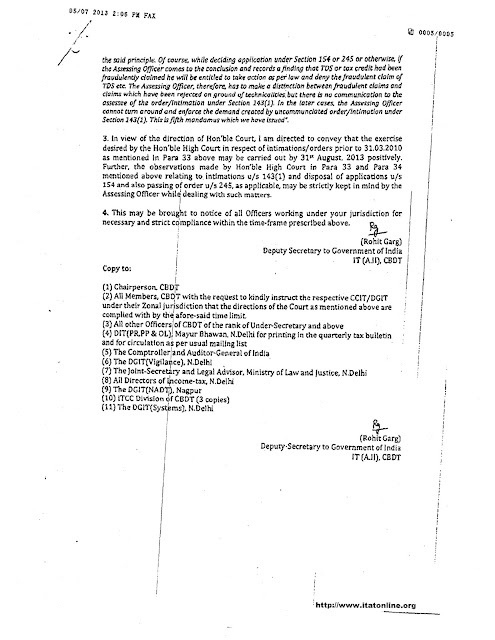 CBDT has vide its press release dated 22.07.2013 clarified that exemption from filing return of income for salaried employees having total income upto Rs. 5 lakhs including income from other sources upto Rs. 10,000/- was only for assessment year 2011-12 and 2012-13 respectively. The exemption was given considering ‘paper filing of returns’ and their ‘processing through manual entry’ on system.However, this year the facility for online filing of returns has been made user-friendly with the advantage of pre-filled return forms. These E-filed forms also get electronically processed at the central processing centre in a speedy manner. 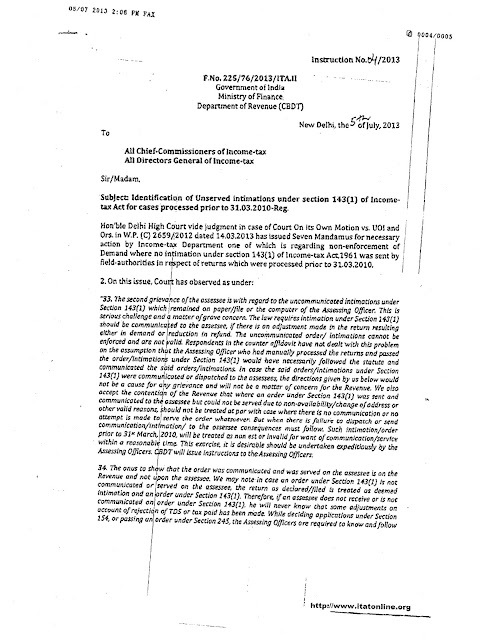 Hence, the exemption provided during the last two years is not being extended for assessment year 2013-14. Taking note of the above fellow practitioners and tax payers falling under the said category may plan accordingly as due date of filing of return is only a week away. Please subscribe to our Blog through email by submitting your email in the email box on homepage. 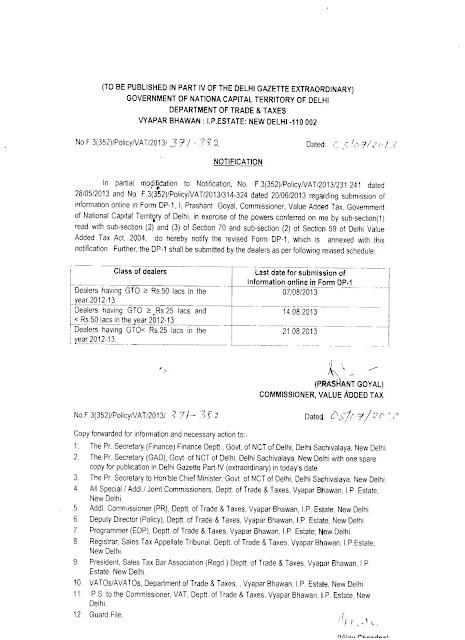 Newly amended form DVAT 16 and DVAT 17 shall be applicable from IInd qtr of 2013-14. · without Goods Receipt Number. · receipt of the goods by the Delhi dealer. · till the GR number in Form T-2 is updated online. The Value Added Tax Department has issued notification no. F3(6)/Fin. (Rev-I)/2013-14/dsVI/499 dated 04/07/2013 thereby amending the rules and introducing changes in Form 1 CST. The details of the changes are available in a presentation which can be downloaded. CBDT Instructions on Identification of Unserved intimations under section 143(1) of Income Tax Act for cases processed prior to 31.03.2010-Reg. which were processed prior to 31.03.2010. 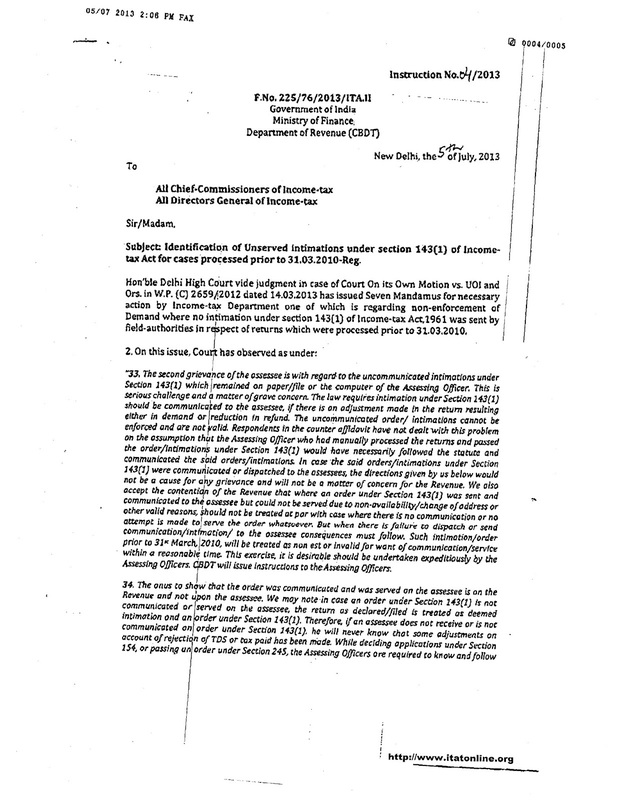 Which means that if a demand was raised prior to 31.03.2010 and the intimation u/s 143(1) was not sent to the assessee, then such a demand can not be enforced by the department. It is also important to note here that the onus to show that the order was communicated and was served on the assessee is on the Revenue and not upon the assessee. the deductor has made payment of the TDS to the Government. 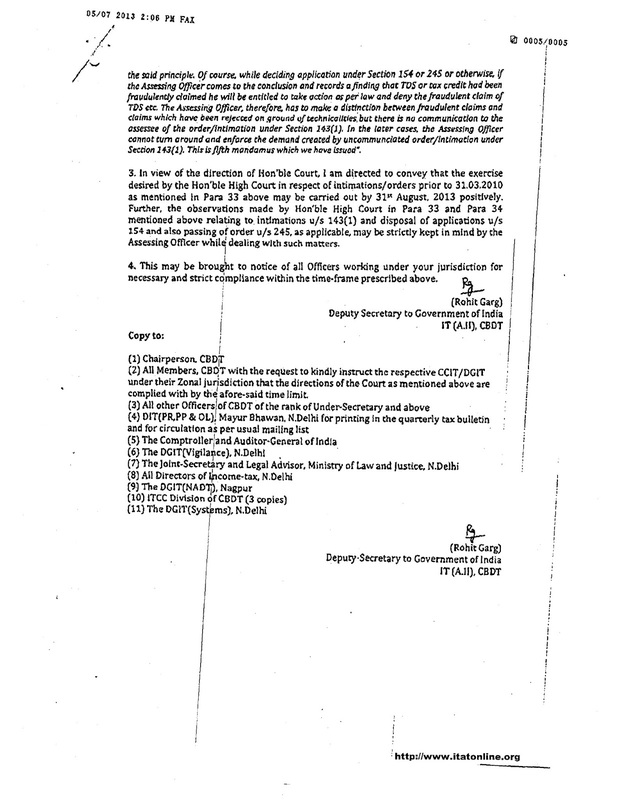 In further modification to Notification No.F.3 (352)/Policy/ VAT/2013/231-241 dated 28.05.2013 and its modification wide Notification dated 20.06.2013 regarding submission of Form DP-1, the last date for filing the form online has been further extended as per the schedule as given below. Information given in this form is very vital, as it is through this data that the department shall issue you a new RC with all your correct information currently updated, even if there is an amendment application lying pending with the department. If you provide the current position of your firm up to date then your new RC shall reflect that correct information provided in this form. using Login ID and Password. Part-B Information of persons interested in business. Part-C Additional Place of Information. Part-D Information about Authorised Signatory. Each part can be filled up separately and saved online. Areas of concern and their solution. On the RC there are 2 dates mentioned. HERE WE HAVE TO MENTION THE DATE OF VALIDITY. You can tick more than one applicable field. Take note of the field Interstate Purchaser and Interstate Seller, do tick wherever applicable. Mention the PAN and the name very carefully as per NSDL database, PAN mentioned must be active as per IT dept. Records. A mistake in filling this field shall render your information incorrect. Please mention the Approximate open area & covered area of Principal place of Business. Give detail of ALL bank accounts of the Dealer. And then under Central Tab. If the Authorised signatory is one or more of these persons then tick Yes in the field below point 7, this shall help to auto fill Part D.
Director or Partner Outside India. Ward of the additional place according to geographical location is to be mentioned. Information is to be provided for all the authorized persons . Please note that if you select authorized person status in Part B then this field shall be auto populated with details of those persons. for entering information for more than on premises or more than one authorized signatory.